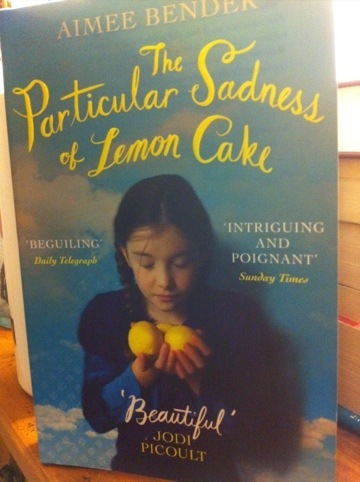 I spent some of my precious Thanksgiving weekend hours reading The Particular Sadness of Lemon Cake, by Aimee Bender. The girl character, Rose, can taste the feelings of the people whose food she eats. Kinda like Like Water for Chocolate, except she doesn’t feel rage if the food’s full of rage, she just won’t like eating that cookie. So there’s an element of mysticalness, but it doesn’t spin into something cool. She eats factory made potato chips instead and we continue to plod through the dynamics of her adolescence. It’s a typical lady-literature bit of fiction, that delves into the very ordinary little pains and misunderstandings and disconnects of a family. The mom is a little too flighty and dad is a little too regular. The brother probably has Asperger’s and our heroine is just sliding under the radar. We get extra bittersweet insight into other characters, especially the mother, due to Rose’s foodie affliction. It turns out that weird super powers run in the family, though, ’cause her brother turns into a folding chair and no one ever sees him again. But seriously. Her brother vanishes never to be seen again, because he has turned into a chair. Only Rose knows the truth. Dad acts like it’s fine, maybe a little puzzling, that his son has disappeared. And mom just believes that he’s exploring the Andes. And Rose keeps her brother the folding chair safely tucked away in her closet. I can’t even pretend to appreciate this lady’s nice writing style because just eye roll. Jodi Picoult said it was “Beautiful” (on the cover) and I’ve never been that into her work either. Thanks for the review. So many books, so little time.